After yesterday’s announcement of the official Google Voice application for iPhone, Google has kept iOS fans on the edge. 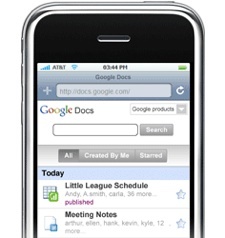 The official Google Docs blog announced a updated version of the Google Docs interface for mobile devices, particularly the iPhone. By pointing your mobile browser to http://docs.google.com/m, you have access to the “mobile-optimized versions” of your documents, spreadsheets, and presentations. However, these features will only be accessible from the iPhone for now with read-only privileges. Bummer! Hopefully, Google will implement editing on the iPhone and bring these features to the rest of the iOS family. For any regular Google Doc user, like us at The Real Mac Genius.com comes in handy!